I have been accruing a number of finds and thought it was about time I shared them with you. Jeans, oh my, well I am going to a hen do in a couple of weeks which will involve Go Ape, so thought it was about time I got some high waisted jeans. These were a bargain from eBay £8.49. I plan on dressing like a lumber jack, you know I love a theme! The peach 1930s satin pyjamas, still in the box! Were a right bargain from the Altrincham Vintage fair £5. The red velvet hat £5, which looks like a glamourous tea cosy when I wear it was from my favourite fair, The Stockport Vintage Village. The black netted number was a sweet gift from my sister, from Zara of all places. The straw hat was from Room at the Top, I have been pining for one of these hats, and now I finally have one another bargain at £9.50. The picnic basket and horse shoe horn were purchases the boyfriend made, apparently he's always wanted a stand up picnic basket who knew?! The basket was £3.99 and the shoe horn 50p both from YMCA. The beautiful grey and white swan was my one and only purchase from The Vintage Guild Weekend, it was £3.99 and is joining my other old biddy swan. The mirror was the priciest at £23.00 supposed to be 1930s but I'm not sure, I am collecting more bits for our house, when we finally get one, please cross your fingers,toes and legs for me ta. Oh and the old grandma pleated polka dot number was from Sue Ryder only £5.00, I need to get more work suitable clothes, but they aren't as fun as ridiculous hats are they?! Me and my gorgeous friend Jo go snapped whilst we were at The Vintage Village, it was nice and sunny, now it is not. My hair looks like crap, need to cut if off. 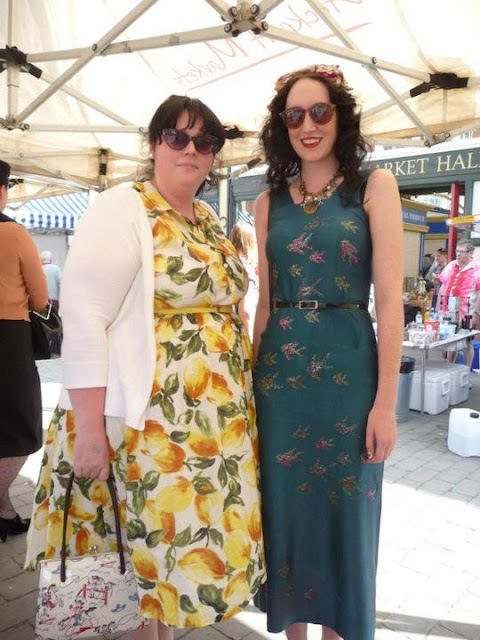 There's a vintage fair at the Armitage Centre in Fallowfield today you know! I'm looking forward to seeing you in those jeans! I love the fish dress. AWESOME. You got some great stuff for so cheap! Can't wait to see the jeans on you! I'm quite envious as I want a pair for myself! Such sweet goodies! Loving that red velvet hat,it's exactly the right shade of red! Your friend Jo's lemon frock is lovely, and as for you and your "crap" hair,be off with you!!! It's perfect isn't it, I need a hat pin for it though. No vintage fairs around me, ahhhhhhhhhhh jealous.